Post-50s Westerns Blu-Ray News #272: The Wild Rovers (1971). | 50 Westerns From The 50s. « Character Actor Of The Day: Hank Worden. Post-50s Westerns Blu-Ray News #272: The Wild Rovers (1971). Warner Archive is bringing Blake Edwards’ wonderful The Wild Rovers (1971) to Blu-Ray. Philip Lathrop’s photography deserves nothing less. This is another one of those movies mangled by its studio — MGM cut about half an hour out of it without Edwards’ knowledge. This Blu-Ray (like the previous DVD) will be Edwards’ longer cut, which rights MGM’s wrongs. William Holden is so good in this. And it makes an interesting companion piece to his work in Peckinpah’s The Wild Bunch (1969) — these are two of the best films ever done about the changing West. This is great western,but as I mentioned before,I don’t think I’ll be double dipping as I already have the DVD .The soundtrack from Film Score Monthly is worth having ( pretty pricey now ) and I’m pretty sure I read in the liner notes that an alternate ending was talked about ,but unsure if it was filmed or not .If it was and included on this release ,I would definitely be shelling out for it ,but then again I did change my mind about buying the THE HANGING TREE BLU RAY. Let’s hope that other studios with unreleased footage worth releasing are reading this blog. 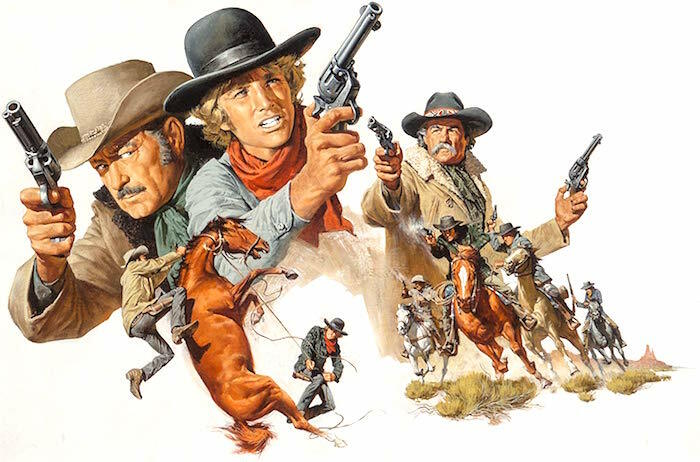 Mighty fine that Warners still have faith in Westerns. out there which looks stunning. I totally agree; YELLOWSTONE KELLY is a magnificent western, and let’s not forget the other 2 of the WALKER/DOUGLAS FILM TRILOGY: FORT DOBBS ’58, AND GOLD OF THE SEVEN SAINTS ’61. These other two treasures really SCREAMED for TECHNICOLOR (following a long period of WARNERCOLOR–sounding better than the EASTMANCOLOR that it actually was), and WHILE the color was lacking in GOLD ,it had ‘ SCOPE–denied to the other 2! WILD ROVERS, is another beautiful western, which had some severe post-editing nightmares, severely chopping up the original work of art (indeed it was) that director EDWARDS intended it to be. Having to edit the beautiful MUSIC SCORE BY JERRY GOLDSMITH, injured these different edits, as well.. So we now have the final cut , (at 132minutes-time on the DVD) . Not to give out any spoilers here, I didn’t care for the final scene, powerful ending that it is on the DVD , the other ending-of choice sounded like a better option. Agreeing here with earlier comment by gcwe1– don’t know if they filmed that ‘other’ ending or not and sort-of explained in the CD ALBUM BOOKLET). (MUSIC ALSO RESTORED!) . Also to note here that The OLDER FIRST- TELEVISION- CUT FILM VERSION, was really a great big MESS OF AN EDIT. I believe EDWARDS disowned his intended masterpiece. FINAL NOTE HERE, as most of you already know, is that a whole bunch of MGM TITLES during the early ’70’s were cut to pieces, to the horror of filmmakers, and fans, as well.. eventually producing several different versions of those titles, as well . The DVD of WILD ROVERS, on WARNER-ARCHIVE NOW, IS a miracle of FILM RESTORATION; with INTRO, and the INTERMISSION TAGS returning rightly were they appeared in it’s 70mm blow-up / uncut premiere where. I was lucky enough to, in 1971 to have seen this EPIC WESTERN in a huge theater-palace, and admitting the fact that I cannot remember WHICH ENDING it had! This film has been pretty much overlooked through the decades–perhaps this new Blu-Ray will gain respect from a new audience.